This tutorial shows how to use graphs in SeqAn and their functionality. A graph in computer science is an ordered pair \(G = (V, E)\) of a set of vertices V and a set of edges E. SeqAn provides different types of graphs and the most well-known graph algorithms as well as some specialized alignment graph algorithms. In this part of the tutorial, we demonstrate how to construct a graph in SeqAn and show the usage of some algorithms. Alignment graphs are described in the tutorial Alignment. Let us follow a simple example. 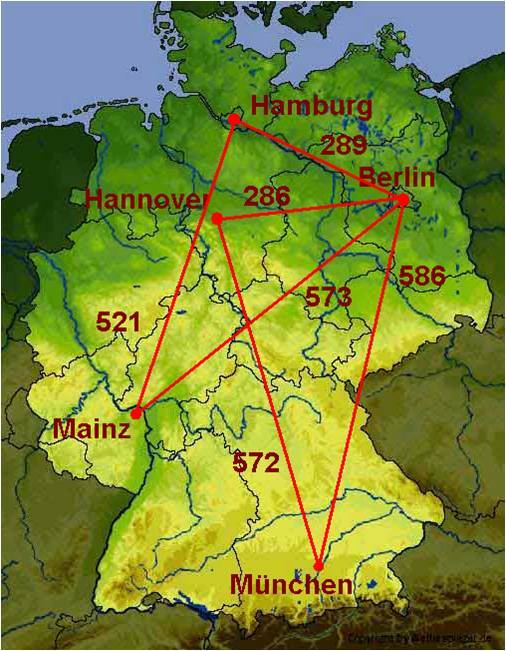 We have given the following network of five cities and in this network we want to compute the shortest path from Hannover to any other city. In the section Graph Basics, we will create the network and write the graph to a .dot file. The section Property Maps assigns city names to the vertices and Graph Iterators demonstrates the usage of a vertex iterator. After having worked through these sections you should be familiar with the general usage of graphs in SeqAn. You are then prepared to proceed with Graph Algorithms, where we will compute the shortest path by calling a single function. The general header file for all types of graphs is <seqan/graph_types.h>. It comprises the Graph class, its specializations, every function for basic graph operations and different iterators. Later, for computing the shortest path we will also need <seqan/graph_algorithms.h> which includes the implementations of most of SeqAn’s graph algorithms. We want to model the network of cities as an undirected graph and label the edges with distances. Before we start creating edges and vertices, we need some typedefs to specify the graph type. SeqAn offers different specializations of the class Graph: Undirected Graph, DirectedGraph, Tree, Word Graph, Automaton, HmmGraph, and Alignment Graph. For our example, an undirected graph will be sufficient, so we define our own graph type TGraph with the specialization Undirected Graph of the class Graph. Luckily, this specialization has an optional cargo template argument, which attaches any kind of object to the edges of the graph. This enables us to store the distances between the cities, our edge labels, using the cargo type TCargo defined as unsigned int. Using the cargo argument, we have to provide a distance when adding an edge. And when we remove an edge we also remove the distance. Each vertex and each edge in a graph is identified by a so-called descriptor. The type of the descriptors is returned by the metafunction VertexDescriptor. In our example, we define a type TVertexDescriptor by calling VertexDescriptor on our graph type. Analogously, there is the metafunction EdgeDescriptor for edge descriptors. We can now create the graph g of our type TGraph. For our example, we add five vertices for the five cities, and six edges connecting the cities. Vertices can be added to g by a call to the function addVertex. The function returns the descriptor of the created vertex. These descriptors are needed to add the edges afterwards. The function addEdge adds an edge to the graph. The arguments of this function are the graph to which the edge is added, the vertices that it connects, and the cargo (which is in our case the distance between the two cities). Once we have created the graph we may want to have a look at it. SeqAn offers the possibility to write a graph to a dot file. With a tool like Graphviz you can then visualize the graph. The only thing that we have to do is to call the function write on a file stream with the tag DotDrawing() and pass over our graph g.
After executing this example, there should be a file graph.dot in your directory. Copy the code from above and adjust it such that a road trip from Berlin via Hamburg and Hannover to Munich is simulated. Click more… to see the solution. Use the function addEdges instead of adding each edge separately. Output the graph to the screen. We first have to include the corresponding header file for graphs. Instead of <seqan/graph_types.h>, we can also include <seqan/graph_algorithms.h> as it already includes <seqan/graph_types.h>. This time we define a DirectedGraph without cargo at the edges. Define an exon, splice, and intron state. Sequences always start in the exon state. The probability to stay in an exon or intron state is 0.9. There is exactly one switch from exon to intron. Between the switch from exon to intron state, the HMM generates exactly one letter in the splice state. The sequence ends in the intron state with a probability of 0.1. Consider to use the type LogProb for the transition probabilities. Output the HMM to the screen. Use the follwing emission probabilities. The program starts with the inclusion of <seqan/graph_algorithms.h>. In this example you could include <seqan/graph_types.h> instead of the algorithms header file. However, it is likely that if you define a graph, you will call a graph algorithm as well. Next, we define our types. The most interesting type here is THmm. It is a Graph with the specialization HmmGraph. The specialization takes itself three template arguments: the alphabet of the sequence that the HMM generates, the type of the transitions, and again a specialization. In our case, we define the transitions to be the logarithm of the probilities (LogProb) and hereby simplify multiplications to summations. For the specialization we explicitly use the Default tag. The default tag can always be omitted but it shows the possibility of further specialization. After that, we define some variables, especially one of our type THmm. Now we can start with defining the states. States are represented by the vertices of the HMM-specialized graph. The initial and terminating states of an HMM in SeqAn are always silent, i.e. they do not generate characters. That is why we have to define an extra begin state and tell the program that this is the initial state of the HMM. The latter is done by calling the function assignBeginState. For our three main states we also add a vertex to the HMM with addVertex. Additionally, we assign the emission probabilities for all possible characters of our alphabet using emissionProbability. Finally, we need to define the end state and call assignEndState. For the HMM, only the transition probabilities are still missing. A transition is represented by an edge of our HMM graph type. The cargo on these edges correspond to the transition probabilities. Since the sequences always start with an exon, we set the transition probability from the begin state to the exon state to 1.0 calling the already well-known function addEdge. And also the other transitions can be defined in the same way. So far, the vertices in our graph can only be distinguished by their vertex descriptor. We will now see how to associate the city names with the vertices. SeqAn uses Property Maps to attach auxiliary information to the vertices and edges of a graph. The cargo parameter that we used above associated distances to the edges. In most scenarios you should use an external property map to attach information to a graph. Be aware that the word external is a hint that the information is stored independently of the graph and functions like removeVertex do not affect the property map. Property maps are simply Strings of a property type and are indexed via the already well-known vertex and edge descriptors. Lets see how we can define a vertex property map for the city names. Our property type is a String of a city name, more explicitly a char string. The vertex property map should hold several names so we define a String of Strings. Now, we only have to create and resize this map so that it can hold information on all vertices. Next, we can enter the city names for each vertex. Note that this is completely independent from our graph object g.
If we now want to output all vertices including their associated information we can iterate through the graph and use the iterators value to access the information in the property map. Let us have a quick look at iterators for graph types. SeqAn provides six different specializations for graph iterators: Vertex Iterator, Adjacency Iterator, Dfs Preorder Iterator, and Bfs Iterator for traversing vertices, and Edge Iterator and Out-edge Iterator for traversing edges. Except for the Vertex Iterator and the Edge Iterator who only depend on the graph, all other graph iterators depend additionally on a specified edge or vertex. To output all vertices of our graph in an arbitrary order, we can define an iterator of the specialization Vertex Iterator and determine its type with the metafunction Iterator. The functions atEnd and goNext also work for graph iterators as for all other iterators in SeqAn. The value of any type of vertex iterator is the vertex descriptor. To print out all city names we have to call the function getProperty on our property map cityNames with the corresponding vertex descriptor that is returned by the value function. The map shall assign a lower-case letter to each of the seven vertices. Find a way to assign the properties to all vertices at once in a single function call (without using the function assignProperty for each vertex separately). Show that the graph is not connected by iterating through the graph in depth-first-search ordering. Output the properties of the reached vertices. Use an array and the function assignVertexMap to assign all properties at once. Use the DFS Iterator for depth-first-search ordering. Our aim is to assign all properties at once to the vertices. Therefore, we create an array containing all the properties, the letters ‘a’ through ‘h’ . The function assignVertexMap does not only resize the vertex map (as resizeVertexMap does) but also initializes it. If we specify the optional parameter prop, the values from the array prop are assigned to the items in the property map. To iterate through the graph in depth-first-search ordering we have to define an Iterator with the specialization DfsPreorderIterator.